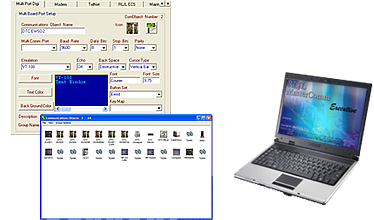 RLJL CommDroid™ is an object-driven system that allows the user to create Button Objects using the RLJL Language. It has the ability to communicate with any peripheral that contains a serial telnet or network interface. Connections to these peripherals are done through serial or LAN interface local to the computer. Therefore, RLJL CommDroid™ can replace other terminal emulation software programs that are no longer supported. Allow Customer Service Representatives to add or change lines or features without direct access to switch or other peripherals. Secure remote access to central office. Control errors and loss of revenue. Data acquisition and storage with detailed report generation. Centralized location for administering telecommunications peripherals (including remotes), CATV headend, and ISP’s. View information transfer or real time monitoring. Automates redundant tasks such as cutoffs, switch to billing audits, and line availability reports. Click here to contact dscTech for more information on CommDroid™.